A little while ago my mate Richie moved to London to a new job with We Are Social. I was lucky enough to be over in London back in February and I can safely say that London suits Richie perfectly. He clearly loves the place and I have a sneaking suspicion that London loves Richie. You see back on the 25th March Richie attended the London Twestival. Not anything too strange or exciting about this, so did 464 other people. So who showed Richie the love? At the twestival the nice people of Chilango, the Mexican food chain, donated a super prize for a giveaway in aid of Concern. The prize was a year’s worth of free burrito meals. I presume you can guess where this is going. Richie was the lucky winner! 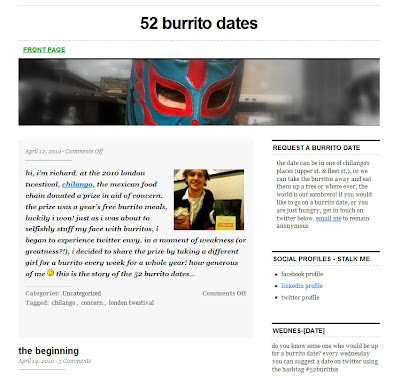 It being a Twitter event the news was out on the web pretty fast, and as you can imagine Richie's initial plan to selfishly stuff his face with burritos was soon dashed. So in a moment, of what Richie described as equal measures weakness and greatness, the decision was made to share the prize. Of course the question remained, how best to share out 52 weeks of burrito meals? I won't spoil the story here by sharing any of the amusing tweets that Richie has already received but you should pop over and check them out. I'll be posting regular updates as the story unfolds (including how his first date with @photogirluk goes!) but for all the good bits you really will need to get to Richie's blog.